The following Industry Canada employees helped perform the measurement work described in this document. Radiocommunication, including the technical aspects related to broadcasting, falls under the responsibility of Industry Canada, which has the power to establish standards, rules, policies and procedures. Under this authority, the Department has adopted Health Canada's Safety Code 6 (SC6) guideline for the purpose of protecting the general public from radio frequency (RF) overexposure. 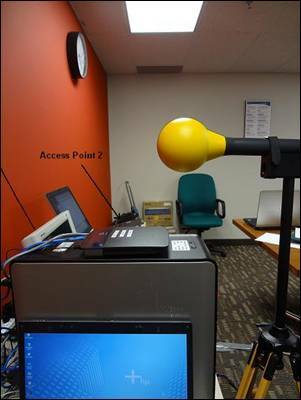 As part of its ongoing monitoring of wireless devices for compliance with regulatory specifications, Industry Canada conducted an extensive series of tests to measure RF exposure from the use of Wi-Fi devices in a simulated classroom setting. This study, performed in late 2011, confirms that the level of RF exposure is considerably below the SC6 limits for uncontrolled environments. The wireless devices that were studied operate at higher power than most Wi-Fi devices currently available in Canada. The measurements were based on 24 laptops and two wireless access points, or routers, used in a situation designed as a worst-case scenario, which involved downloads of a very large file, such as a video file, as well as the use of interactive applications among several computers, as would be found in a school setting. Measurements were taken at several points in the room and at various distances from the Wi-Fi access points, including those where higher levels of RF exposure are typically reported. All measurements of RF exposure were well below the SC6 limits for uncontrolled environments. Many consumers, businesses, and public and private institutions (such as schools, hospitals and libraries) install Wi-Fi access points on their premises. These Wi-Fi access points typically consist of one or more low-power transmitters installed at ceiling level or on tabletops, which are used by individuals to gain Internet access through standard Wi-Fi-enabled devices, such as laptops. 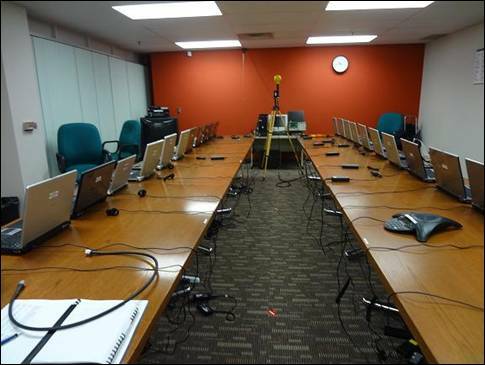 To address the recent public concerns related to the proliferation of Wi-Fi technology, Industry Canada staff performed measurements of radio frequency (RF) field measurements in an Industry Canada boardroom located in Aurora, Ontario. The boardroom contained two Wi-Fi access points and 24 Wi-Fi-enabled devices (laptops). The goal of this study was to obtain measurements of the levels of aggregated RF exposure from multiple Wi-Fi access points and Wi-Fi-enabled devices in an indoor environment. Industry Canada has adopted Health Canada's guideline for the purpose of protecting the general public from RF overexposure. All installations and apparatus must comply with the SC6 limits for uncontrolled environments. The maximum exposure limit of SC6 is expressed in terms of field strength (volts per metre, or V/m, and amperes per metre, or A/m) or power density (watts per square metre, or W/m2). This document presents the results more simply as percentage of SC6 limits for uncontrolled environments. In accordance with the requirements for spatial and time averaging set forth by Industry Canada, the RF exposure level was measured at 0.19% of the SC6 limits (515 times below the limit). This value includes the measurement equipment uncertainty. In this scenario, the two Wi-Fi access points were operational with the 24 Wi-Fi-enabled devices downloading a large file simultaneously. This measurement was carried out at the location found to exhibit the highest RF exposure level during the initial scanning of the boardroom. For these measurements, the Wi-Fi access point 1 (AP1) was in a test mode that forced it to transmit continuously, while the Wi-Fi access point 2 (AP2) was in normal communication with all 24 laptops, which were all in downloading mode. With one of the Wi-Fi access points set to transmit continuously while test software was used, the measured RF levels were higher than they would be for the same device in normal operating mode. Measurements were also conducted at one location with the laptops in different uploading or downloading modes, or both, to determine the variations in RF exposure levels. For these measurements, the laptops were connected to Wi-Fi AP2, operating at 2437 MHz. The highest average RF level obtained from among four different uploading and/or downloading configurations occurred when a single laptop was in downloading mode, as opposed to numerous laptops in uploading mode, downloading mode, or both. At 20 cm from the Wi-Fi access points, the maximum instantaneous RF exposure levels obtained for Wi-Fi AP1 and Wi-Fi AP2 were 10.59% and 7.73% of the SC6 limits, respectively. For a typical scenario in which a person is located at several metres from the access point and surrounded by other users, the RF exposure level will be thousands of times below the SC6 limits. 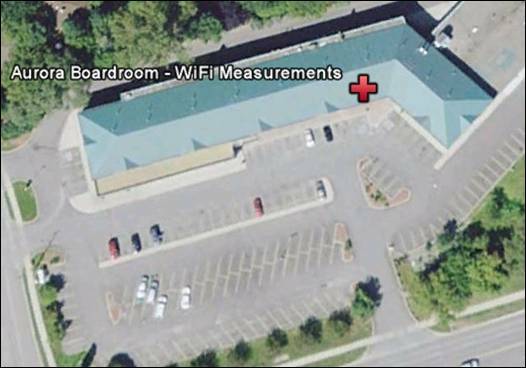 Industry Canada found that the aggregated RF exposure levels are well below the SC6 limits at this indoor location. In addition, the Wi-Fi access points selected for this study were operating at higher power compared with most of the Wi-Fi devices currently available on the Canadian market. Therefore, the results of this study are likely higher than would typically be observed in equivalent setups in public and private environments. Wi-Fi is a trademark of the Wi-Fi Alliance. Manufacturers may use the term "Wi-Fi" to brand certified products that belong to a class of wireless local area network (WLAN) devices based on IEEE 802.11 standards. Because of the close relationship with its underlying standards, the term "Wi-Fi" is often used as a synonym for IEEE 802.11 technology (see Annex A). Under Industry Canada's regulations, Wi-Fi devices are licence-exempt if they meet the technical certification requirements of both RSS-210, Licence-exempt Radio Apparatus (All Frequency Bands): Category I Equipment,4 which includes specifications for power levels, and RSS-102, Radio Frequency (RF) Exposure Compliance of Radiocommunication Apparatus (All Frequency Bands),5 which includes Health Canada's Safety Code 6 (SC6)6 limits for RF exposure (see Annex D of this document). An RF exposure evaluation7 must be performed on Wi-Fi access points.8 As part of the certification requirements outlined in RSS-102, a specific absorption rate (SAR) evaluation9 must be performed on Wi-Fi-enabled devices, such as laptops that contain the Wi-Fi client cards. Under the requirements of RSS-102, the manufacturer is also responsible for providing proper instruction to users of wireless devices and for informing users of any usage restrictions to ensure compliance with the SC6 limits. In Canada, Wi-Fi systems may operate at 2400-2483.5 MHz (RSS-210, Annex 8), 5150-5350 MHz (RSS-210, Annex 9), 5470-5825 MHz (RSS-210, Annex 9) and 5725-5875 MHz (RSS-210, Annex 8), using either 20- or 40-MHz channels. Wi-Fi devices may operate at different power levels, depending on the band and operating characteristics. Based on the technical requirements of RSS-210, the maximum conducted power (into the antenna) and maximum equivalent isotropically radiated power (e.i.r.p.) must not exceed 1 watt and 4 watts, respectively. However, the majority of Wi-Fi devices currently on the Canadian market operate at lower power (e.g. <1 W e.i.r.p.). Many consumers, businesses, and public and private institutions install Wi-Fi access points on their premises. These access points typically consist of one or more low-power transmitters installed at ceiling level or on tabletops, which are used by individuals to gain Internet access through standard Wi-Fi-enabled-devices, such as laptops. Given the recent public concerns related to the proliferation of Wi-Fi technology, the goal of this case study was to obtain RF exposure levels from multiple access points and Wi-Fi-enabled devices in an indoor environment, and to assess compliance with the SC6 limits. However, the testing of all possible configurations under which these devices are deployed would not be possible. Therefore, specific scenarios were tested to determine the levels of aggregated RF exposure within an indoor environment. Table 1 lists the equipment for RF measurement that was used during the Wi-Fi measurement case study, including the equipment used during the laboratory testing for radiated emission levels. Auxiliary devices, such as non-metallic tripod, measuring tape, digital camera and masking tape, were also used during the study. The Narda SRM 3006 Selective Radiation Meter was set in the Safety Evaluation mode. It displayed the RF exposure levels as a percentage of the SC6 limits. Between 50 and 70 sweeps10 of approximately 1.2 second per sweep were performed at each measurement location (except when a time-averaging period of 6 minutes was applied). The Wi-Fi access points and Wi-Fi-enabled laptops used during this case study can be found in Table 2 and Table 3, respectively. Wi-Fi access point 1 (AP1) was set to transmit continuously11 through the use of the test-mode software. The continuous transmission was selected to provide a worst-case exposure from this Wi-Fi access point. The operating center frequency was set at 5180 MHz (Channel 36). AP1 was installed on the ceiling with the antenna located at approximately 2.05 metres from the floor (see Figure 1). The antenna panel used had a directional gain of 7.5 dBi. 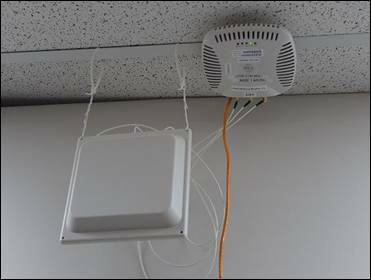 For Wi-Fi access point 2 (AP2), the device was transmitting normally at a center frequency of 2437 MHz (Channel 6). Test software was not available for AP2. Therefore, measurements were not performed in continuous mode for this access point. AP2 was installed on top of a computer desktop tower at approximately 1.1 metres from the floor (see Figure 2). These two access points were specifically chosen because they had slightly higher e.i.r.p. values than most Wi-Fi access points currently on the Canadian market. With Wi-Fi AP1 set to transmit continuously, the measured RF levels are higher than when the same device is in normal operating mode.13 Therefore, the results of this study are likely higher than would typically be observed in equivalent setups in public and private environments. The program NetStumbler14 was installed on a laptop to identify the Wi-Fi access points in the area. The software provided information on the signal strength of each Wi-Fi access point. On November 8, 2011, NetStumbler detected four additional access points. These Wi-Fi access points had signal strengths that were 45-51 dB lower than the two Wi-Fi access points being tested. On November 9, 2011, NetStumbler detected seven additional Wi-Fi access points. These Wi-Fi access points had signal strengths that were 33-65 dB lower than AP1 and AP2. These additional Wi-Fi access points were all operating in the 2.4 GHz band. The measurements were performed on November 8-9, 2011, in an Industry Canada office located in Aurora, Ontario (see Figure 3). The temperature within the boardroom was approximately 20oC with low humidity. 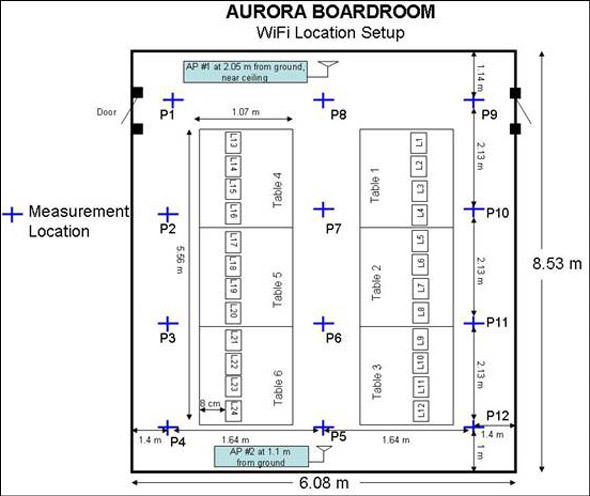 The measurement locations within the boardroom are represented in Figure 4, and a photo of the boardroom setup is presented in Figure 5. This case study did not include an assessment of near-field exposure, which requires a laboratory test setup to determine compliance with the SAR limits outlined in RSS-102. SAR evaluations of Wi-Fi-enabled devices such as laptop computers are conducted as part of the technical requirements for certification by independent laboratories, so this assessment would already have been performed. Table 4 and Table 5 present details of the test cases related to the ambient fields and to the Wi-Fi devices in operation, respectively. a See Figure 4 for preselected measurement locations. b The height of 1.25 metres is approximately the height of a person in the sitting position. c The nine-point matrix is described in Health Canada's Technical Guide for Interpretation and Compliance Assessment of Health Canada's Radiofrequency Exposure Guidelines (http://www.hc-sc.gc.ca/ewh-semt/pubs/radiation/radio_guide-lignes_direct-eng.php). a Downloading mode: Wi-Fi-enabled devices are receiving data from a remote network location (from a host server via a Wi-Fi access point). b For each point in the nine-point matrix, a measurement of 6 minutes is performed to provide the RF level based on spatial and time averaging. c Uploading mode: Wi-Fi-enabled devices are sending data to a remote network location (to a host server via a Wi-Fi access point).